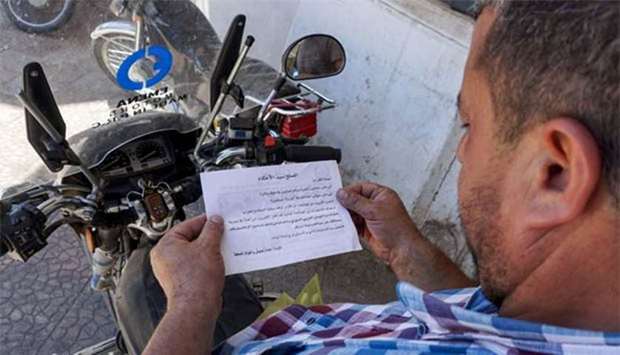 A Syrian man holds a leaflet stamped with the government forces' seal and dropped by helicopters flying over the northwestern Syrian town of Binnish on Thursday. 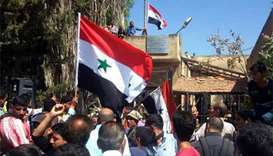 The Syrian army dropped leaflets over Idlib province on Thursday, urging people in part of the last big swathe of territory still held by rebels to agree to a return of state rule, telling them the seven year war was nearing its end. The United Nations worries that an offensive in the area could force 2.5 million people towards the Turkish border. Nato member Turkey, which has troops at 12 bases in Syria's northwest to observe a truce agreed with Russia and Iran, has warned against any offensive in Idlib, and is pressing Russia to make sure this doesn't happen. "This war must end not in a bloodbath but in agreements," he said. But he added that the UN was making preparations and that he would ask Turkey to keep its borders open for fleeing civilians. The leaflets, dropped in rural valleys near Idlib city, told residents: "Your cooperation with the Syrian Arab Army will release you from the rule of militants and terrorists, and will preserve your and your families' lives." "We call upon you to join local reconciliation (agreements) as many others in Syria have done," said a leaflet in the name of the army command, a copy of which was seen by Reuters. Idlib is controlled by an array of insurgent groups, with jihadists believed to be the dominant force there.